Anyway you can reload this and get these tracks individually? I'd have too look into a way to do that without reposting each track. Thanks for the suggestion. I also wanted to make easy to skip to my favorite track. I solved it by using audio splitter with function "split by silence". It changed duration of individual tracks a bit and reduced quality unfortunately. But if that does not bother you I can upload it somewhere into the web. Hey, it's a free country, I'm some will appreciate that. Just take the entire file, and chop it up into sections, then into each individual tracks 9don't forget to add a bit of lead in/lead out to each one. Wow, i was listening to the music, and the track at 56:00 sounds as if it was inspired by Richard Rodgers (Victory At Sea). Glad the one with the Rock didn't pan out - I wanted to be spared the sight of him with white hair trying to be Race Bannon! I actually have Victory at Sea somewhere, and love that series. I'll have to check it out. Thanks! Thank you for sharing such great music! Hey is there anyway I can get this entire track? Is there a download link? Hi Justin - Thanks for asking, but I'm not sure where this recording is available. I've searched for it online, as have others, but it seems to be a very rare item. I sure would like to know who the musicians were. I finally found a copy of this at the Salt Lake Comic Con last week, and it is fantastic. Holy Cow - There are other copies! I wish I knew something about the history of this disc. I got mine at the NY Comic Con. It's a VERY rare find indeed. I ordered a copy. I look forward to reviewing it and comparing the two releases! Hadji is Sikh. Not Muslim. Big difference. His full name is Hadji Singh. Parents were Sikh too. He did practice yoga though. That was a later retcon. In the original series, which this article addresses, Hadji's specific faith, nor his last name (Singh), are revealed - only than his name first Hadji suggesting a Muslim connection. The assertion he is Sikh seems to run counter to his first name "Hadji" which reflects the Islamic journey to Mecca, which Sikh's do not do. The retcon of Hadji being a Sikh seems to be an invention of Westren authors unfamiliar with both Islam and Sikhism. At the time of the initial broadcast in 1964, and for decades thereafter (which I'm old enough to remember), the presumption was Hadji was Muslim. 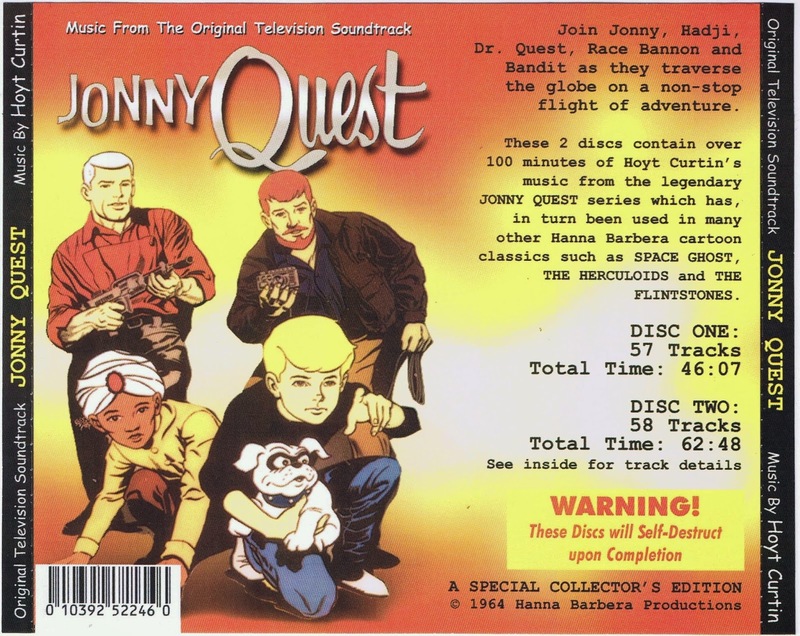 Hadji's last name Singh was not revealed until "The Real Adventures of Jonny Quest" three decades after the initial series and probably not coincidently following the First Gulf War when Western antipathy towards Islam was on the rise. My belief is that the producers likely choose Sikhism as Hadji's to avoid politics and this created the problem of a Sikh given a first name which reflects a pilgrimage to Mecca - Hadji. The producer's lacked any real knowledge of either faith, or hoped Western audiences were ignorant enough not to know the difference. 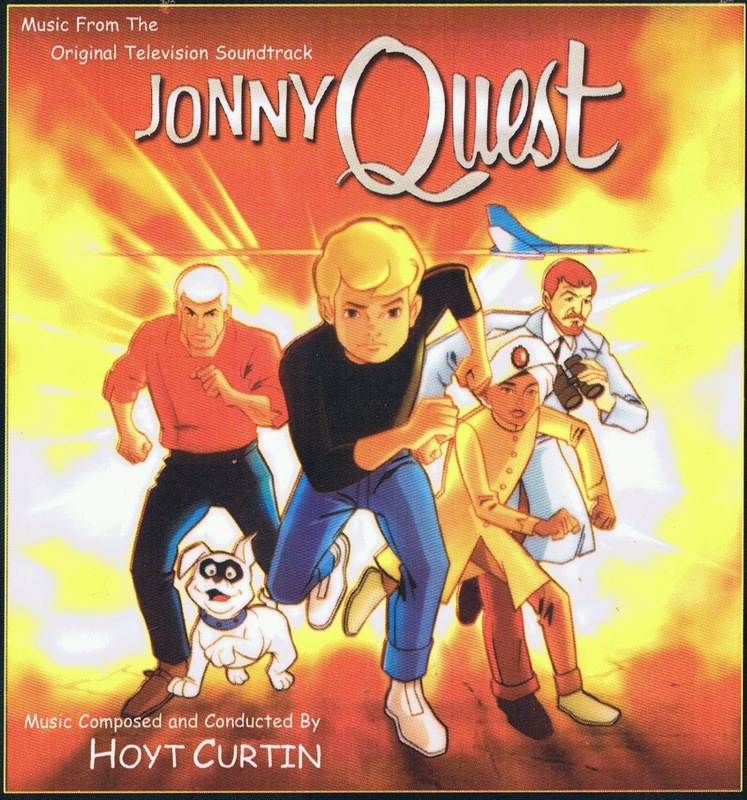 Can you shed some light here, and tell me about THIS CD soundtrack of "JONNY QUEST" as compared to the LaLa Land CD that was recently released. 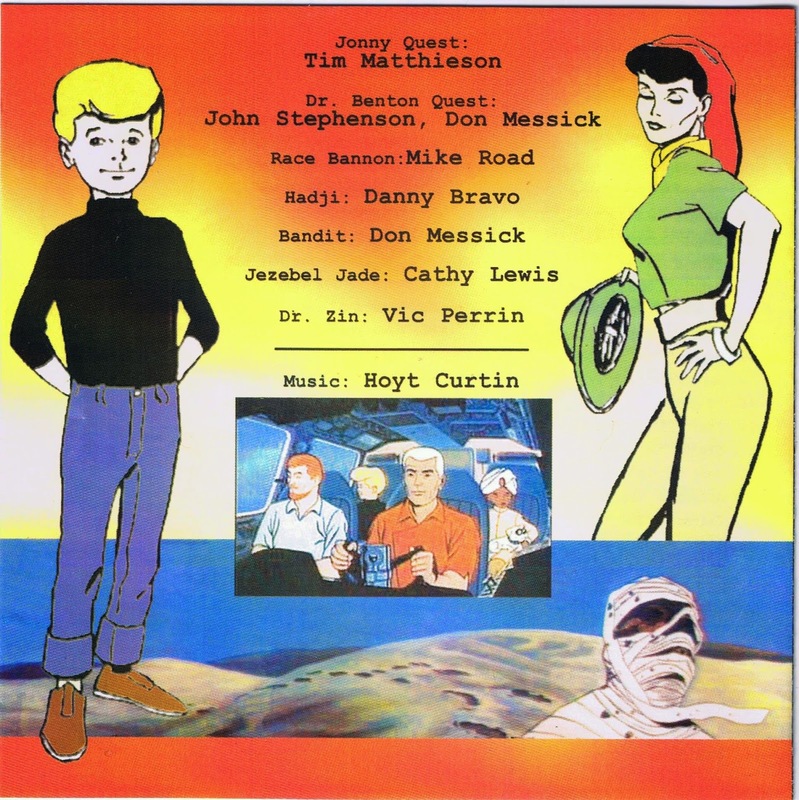 i paid for this two disc set, but i was very disappointed when it did not include other Hoyt Curtin and Ted Nichols soundtracks that i had so hoped for, so tell me, is it in anyway possible to buy THIS soundtrack set, or is that impossible? get back to me on that, because i'll pay within reason, if this CD set is in anyway available! You can e-mail me at the e-mail link on my "About ME" page - whose link is available on the right margin links. I was about to put it up for auction on eBay, but if you're interested I'll entertain an offer. It is very rare and you likely won't find it anywhere else! Thanks a million for posting this. Like you this was one of my favorite soundtracks growing up and still is. 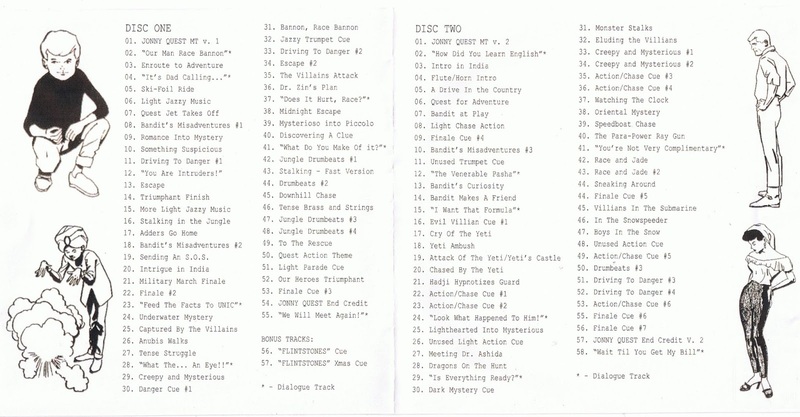 Is there any chance you can post the entire set in lossless format somewhere. As you said, it's pretty unlikely I'll find a copy of it since it's rare and out of print. I had to look that one up. I'm always up to explore a new format, but don't know anything about converting it to a lossless format. If you know of any good articles or software tools, please share the link! I was going to sell it on eBay in the next few weeks. Reserve will be high. If interested you can e-mail me through my About Me link on the right side bar. These tunes introduced me to the world of Jazz at a very early age. I can't tell you how much I have enjoyed these tunes, when I was young and then again just now. They bring back a ton of memories and nostalgia which I've shared with my son and daughter. They both love all things JQ. Thanks! They must have a great dad! Thanks for listening! the boy is Muslim, though his faith is never explicitly discussed. 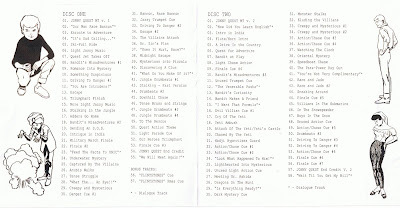 G. Jack Urso thank you for sharing about music From The Original Television Series at https://topelectricdrumsets.com site. My love for jazz never ends either especially if the music runs in a great tv series, great post. Many thanks! Here's a JQ ringtone links!